Beer brewing can be a thankless task at times and no one will thank you if you serve them a horrible tasting home brew when you host your mates for a 'BBQ and Brews' evening. Here are 5 mistakes that home brewers should bear in mind before they even begin to open the can of malt extract from their kit. If you follow them well, you'll be sure to produce some delicious tasting brews. 1. Wash, wash away your sins. Sanitise the heck out of everything you use. If you're starting out as a home brewer, your equipment and kit should contain a cleansing and sterilizing agent. You NEED to make sure that at the very least your drum is fully clean and sterilized before your start your brewery process. If brewing is going to become a hobby, sanitization needs to be a habit. There is nothing more disappointing than going to bottle your brew and recognizing the scent of a bad brew that has been contaminated by nasty bugs. It would be a mistake to think that homebrewing is basically a 'set and forget' process. Well, it can be and a key part of that is making sure that where ever you leave your beer to ferment that it's a place that has the desired temperature and that it is a constant temperature. Don't leave your beer outside on the back porch to do its thing! Too much heat will kill the yeast so no direct sunlight. Too much cold and it will go dormant. Leave it wrapped in blankets in your garden shed if you have to, but make sure it's in a generally constantly heated place. Heating matts are pretty popular to keep beer at a constant temp. My work colleague leaves her beer brewing in the bathtub! Just because the bubbles have stopped bubbling through the airlock, it doesn't mean the fermentation process is complete. It would be a real shame for your bottled beer to start exploding if you haven't given the beer a chance to finish the process. Use a hydrometer to ensure the fermentation is finished before you at least consider getting that beer into glass bottles. Hint: more experienced brewers tend to let the batch sit in the fermenter for at least a week longer than normally recommended on beer kit cans or after fermentation is complete. In the sense that the yeast has stopped feasting on the sugars and making alcohol, fermentation has finished however there's a 'tidy up' phase where sediment falls to the bottom of the fermenter which helps clear the beer and the yeast will continue to tick things over. Get the basics of beer brewing down first. Before you run off and try and make the fanciest beer you can that features some imported yeast from England and three different kinds of hops, learn the principles of beer making. 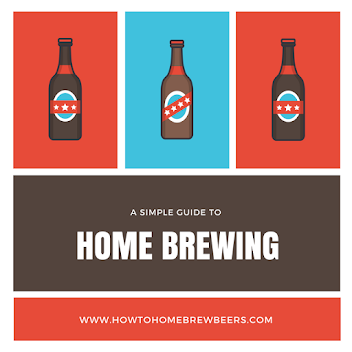 You will enjoy your first few brewing experiences if you keep them simple. Then you can start to branch out into more complicated recipes and practices. If you write down what you did, what you used, when you did it and why you'll have a good basis on which to make a judgement about your beer brewing failures and successes. If you find that you've pulled off a stunner of a beer, you might be able to figure out just exactly how that happened. It could be the difference between remembering that you used a certain kind of hops in your brew! It is a mistake for sure to drink your beer too early. Post-bottling, your beer needs time to carbonate. It also needs time to just chill and do its thing. The fermentation process is in a sense a simple chemical reaction but there is a complex relationship going on with the beer's ingredients that need time to sort themselves out. The patient beer drinker who leaves his beer at least three weeks before indulging will be a better beer maker for it. If you can make it to 5 or 6 weeks before you taste, the better your beer should taste. That said, if you are keen on a hoppy beer, you can be forgiven for getting into it earlier. Want to make the best ph Meter buying choice? What's a good ph meter for home brewing? Coming from the clean and green wilds of New Zealand, I've never really bothered wondering about the quality of water I use with my home brewing. In most places of NZ, the water from the tap is simply delicious, clean and quite perfect for homebrewing. But not all water is the same. Ever heard of a place called Flint, Michigan? My vague recollections of 5th form science are that there's hard water, soft water and everything in between. And then there's the pH of water. But is that what we care about when making beer? It's really the pH of the mash that brewers like to think about. pH is the measurement of acidity or alkalinity of a solution, where the number of hydrogen ions is measured. In the last 10 years or so, an increased understanding of the important role that the pH level of the mash plays in brewing really good beer has driven both commercial and backyard brewers to closely focus on monitoring and then adjusting their mash pH levels as required. So what is a pH meter? A pH meter is a scientific instrument that measures the hydrogen-ion activity in water-based solutions, indicating its acidity or alkalinity. The pH meter measures the difference in 'electrical potential' between a pH electrode and a reference electrode. This page has an excellent explanation of how ph Meters actually work and explains the science behind them really well. pH meters may be utilized in many applications ranging from laboratory experimentation to quality control and checking that your batch of wine or kombucha is on the correct fermentation path but for the beer brewer, we are concentrating on the beer mash. The modern food and beverage industries cannot exist without them! In terms of the home environment, their many uses include aquariums, hot pools, drinking water, swimming pools, home hydroponics, preparation of kombucha and the like. The best meters are leak proof, maintenance free (other than the electrodes), are robust and sturdy in that they don't break easily, and they're not affected by dirt and electrode replacement must be straightforward! They should also be affordable and in many instances work best if handheld. This is a fairly popular pocket product from Oakton. The display is fairly large with a good viewing angle. It has indicators for battery life (1000 hours), readiness, and calibration (one touch), and shows both the parameter and temperature readings at the same time. The cap was recently redesigned to be leak-proof and can be attached to the top of the meter when not being used— so no more lost caps for the homebrewers! The cap features a fill line, so you know how much beer wort sample you need for an accurate reading when using the cap as a sample cup. It is also wider, providing a base to keep the meter upright for hands-free measurements. Takes four A76 1.5 V miniature alkaline batteries which can achieve a battery life of 100 hours. Why head to good old cheap Walmart when you can check the price on Amazon! Remember if you have Amazon Prime, you can get free shipping! The MW102 Standard Portable pH / Temperature Meter Standard is a standard yet affordable portable meter with no frills. The Milwaukee brand is recognized as having a reputation for producing low-cost durable meters for quick and reliable measurements. Milwaukee’s Standard manufacturer advertises that their digital meters are "manufactured to be easy to use, practical and accurate. Ideal for the classroom, laboratory or for general field use". The MW102 is a microprocessor-based pH/Temperature meter with extended range (-2.00 to 16.00 pH), Automatic Temperature Compensation, automatic calibration in 2 points and ±0.02 pH accuracy. 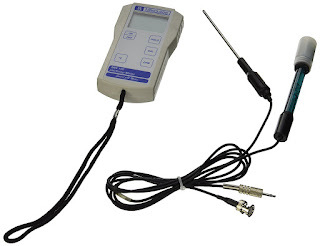 The meter is supplied with pH electrode and calibration solutions. It's thus quite ideal for anyone working on a low budget but still requiring fast and reliable measurements. The battery life is estimated by at 300 hours and it features an auto-off after 8 minutes of inactivity. "fantastic tool to have in my brewing arsenal. I originally bought it for taking readings while kettle souring, but it's been invaluable as I dove deeper into water profile and mash pH adjustment. It's a bit more expensive than some of the cheaper meters out there, but you get what you pay for. Worth every penny in my book, and I regularly recommend it to those in the market for a high-quality meter." If you looking for an upmarket solution to measure your pH solutions then the tried and true Bluelabs brand has the measuring device you are looking for. It's the real deal analyzer. 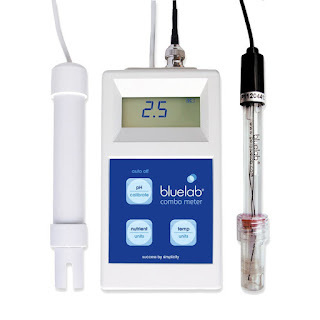 The Bluelab Combo Meter is a portable pH, conductivity and temperature meter all in one. The meter has two probes, a pH Probe and a conductivity/temperature probe. When taking a reading, simply place them into the solution and the selected reading is displayed on the screen. The calibration of the pH probe is fairly simple as instructions are supplied on the back of the meter and the easy push button method makes this one of the no-brainer meters to try. The pH probe is replaceable so you can use this meter for years to come. You really should be able to do as Bluelab offer a 5 year warranty on their product which should give you an idea of the quality of the product and the faith the brand has in it. 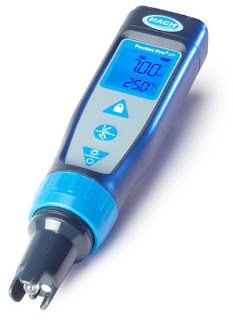 Manufacturer Hach reckons that their digital Pocket Pro + will "take the guesswork out of your measurements" which is entirely the point of a pH meter so a good start that we are on the same page. Hach Pocket Pro+ is engineered to deliver accurate results. Hach boasts the Pro is backed up with built-in performance diagnostics, you never have to guess when to clean or calibrate the sensor. Featuring a large, easy-to-read LCD screen, the pH range covers 0 to 14 pH meaning it can be used for more than beer brewing, like hydroponics. The unit takes 4 Triple AAA batteries which are easy to replace. Hach recommends that the electrodes are replaced every 6 months. This unit comes with a replacement unit. The Hanna Instruments HI 98128 is a popular compact pH tester used in laboratory and industrial applications. Housing that floats in case you drop it. The dual-line LCD screen simultaneously shows the current measurement and the current temperature, and a hold function freezes readings for recording. The meter has automatic calibration at one or two points with two sets of standard buffers (pH 4.01/7.01/10.01 or pH 4.01/6.86/9.18). The meter has a water-resistant housing, a tactile grip casing, and floats. The unit requires four 1.5V AA batteries which provide approximately 300 hours of continuous use. The Hanna meter switches off after eight minutes of inactivity to preserve battery life. The meter also comes with an' HI 73127 pH electrode', an electrode removal tool, and instructions on how to properly use and care for the unit. This is a cheap and affordable unit so its long-term resilience may be questionable. Apera is a well known and trusted brand and one we happily recommend. Also comes with calibration buffer solutions, calibration bottles, storage solutions, AAA batteries, and a lanyard all in a portable carrying case! But why do brewers care about mash pH? First of all, beers brewed within a general range of ph tend to brew better than beers that are too acidic or too low in pH. So, brewers like to take the ph of their mash to determine if it is in the optimal range for the beer they are trying to make. The optimal range is generally considered to be pH 5.2 to 5.4. A high reading means the beer is too alkaline. If a brewer's meter determines the pH is too high, they will then need to adjust the level downward by adding acid or calcium sulfate. So how do I use a Ph Meter to test my beer mash? pH meters are basically glorified volt meters that measure the 'electrical potential' produced by a special pH probe. Using a pH meter is a fairly simple process. One should generally draw a small sample of the wort and put in a vessel such as a shot glass. Dip the probes fully into it to get a pH reading. Make sure your device is turned on and that you have calibrated the meter first! And remember, the mash can be hot, so be careful not to burn yourself. THAT said, pH levels should be measured at near room temperature to get an accurate result (that's just good science). So if you could cool your sample quickly (a short time in the fridge), maybe give a stir, you'll get a genuine reading. Don't cool it too much as you'll go below room temperature. I've read that one dude keeps shot glasses ready in the freezer to help with cooling! Why do I have to calibrate my ph Meter? You need an accurate reading so you can make the best decision for your beer! To make a calibration curve at least three standards are needed. Without the standardized pH buffer to calibrate the meter, the results will not be accurate and thus give you the wrong impression. PH meters can 'drift' from their calibrated settings. It is important to calibrate your pH meter often so that the accuracy of results is maintained. What are the specifications of a good ph Meter? What is Automatic Temperature Compensation? Many higher quality meters use ATC functionality. This is when the unit compensates for the response of the pH meter's electrode with varying temperature. As mentioned elsewhere in this post the mash's pH measurement is ideally conducted at room-temperature. This helps avoid measurement errors that can be caused by temperature effects on the probe and chemically in the mash. So ATC accounts for differing temperatures of the mash. Probes wear out over time and you should expect that you’ll have to replace quality ones every 2-3 years if you take good care of it and how much use they get. The probes should be stored in a pH storage solution to preserve their lifespan. Open, dry air ruins their potential. 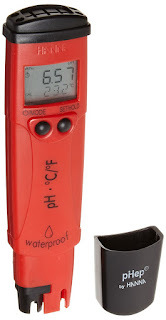 So when buying your pH meter you need to purchase a pH buffer or 'calibration kit'. This is why units like the Milwaukee MW102 and Omega PHH-7011 come with solutions but replacement calibration kits can be separately brought online. You might see them called 'reference solutions'. Keeping the probe clean after each use will prolong their life - it's a good idea to clean the outside with a soft toothbrush and deionized water, being very gentle with the bulb part of the probe if this is the kind you have. It's extremely important to never let the probe dry out and this is a common mistake when storing ph meters. To this end, it is imperative that you store the electrode as per the manufacturers' instructions. The normal way to store the probe electrode is in the recommended storage solution which is normally a concentrated form of potassium chloride. 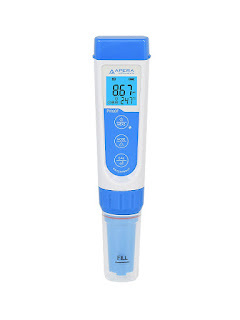 I see the phrase "where can I buy a cheap ph meter for brewing?" all the time. While I understand money talks, I don't think cheapness should really be a motivation when buying a meter or most brewing equipment. The cheaper the unit, the more likely you will get less than accurate readings and the units electrodes themselves will not last long if used frequently. Many a brewer has found that by investing in a better quality unit, they get the best results. To that end, we generally recommend a price point from 100 to 150 dollars. That said you can go cray cray on price so if going high value, make sure you will get the benefit. More serious brewers tend to go for benchtop units rather than the portable kind. You could liken it to how beginner brewers start out. The first thing they buy is a brew kettle or pot and they usually get the get the cheaper, smaller size kettle – and then suddenly they find they want to keep going with beer making and so need to purchase the bigger kettle or brewing pot. It's the same with the ph meter - get the better one to save you having to buy another later on. Did you ever get to use litmus paper in school science to determine if a solution was an acid or a base? The red paper turned blue or something. While litmus paper is a yes or no test if a solution is acidic or alkaline, the pH strip gives you an approximate measurement of the actual pH. Thus, you can use ph strips to test your beer if you wish but those will only give an indication as to your water or brew's pH level, and will never be as accurate as a quality meter. OK, so my pH level is too high, what do I do? You can use gypsum to increase bitterness and reduce ph levels. You can also consider changing your water source if possible, bad luck if you live near Flint.